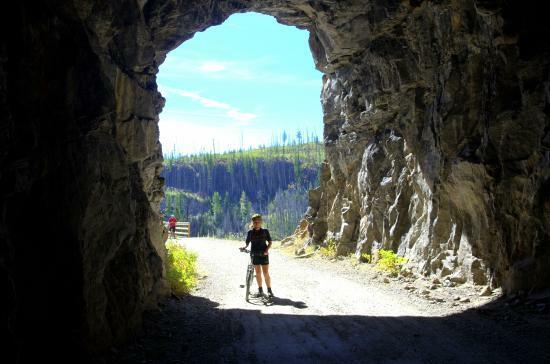 The most famous ride in the Okanagan - this is one for your bucket list. Nature provides the stunning scenery - we provide the amazing history of this wonder. We'll point out details not included in any other tour to give you a sense of what it was like to build this railway over 100 years ago and then rebuild it as a rail trail after a disastrous forest fire in 2003. They called it McCulloch's Wonder - one of the most remarkable feats of rail engineering anywhere in the world. 18 trestles hug the sides of Myra Canyon, providing a vital link between the rich natural resources of the Interior and the port of Vancouver. Learn how these tunnels were literally blasted and chiseled out of bare rock. Touch the walls and imagine the steam engines that rumbled through here. "Each item on our menu is made by hand and from scratch, crafted together from years of experience and chef collaboration. Waterfront Café provides Kelowna with a beautiful spot for great tasting food, made from and inspired by quality ingredients – it’s how food is meant to be!" We'll join you for our last dinner of the week, a fabulous hosted dinner at Quail's Gate's Old Vines Restaurant. "Rated as one of the top 100 restaurants in Canada, Old Vines Restaurant is an all-seasons, farm-to-table culinary destination. Chef Roger Sleiman and his team create spectacular dishes made from the freshest local ingredients, providing guests with a true taste of the Okanagan."